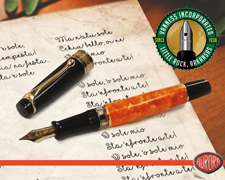 Blog reviews on fountain pens and fountain pen friendly paper and accessories. A review of the Robert Oster Dark Chocolate ink I was provided with from Frank of Federalist Pens at the 2016 DC Pen Show for review. Get the Robert Oster inks here. I added some folded nib fun below. This ink is a lot of fun and I think I will be trying it for an everyday ink.